Here's my WorldNetDaily column for the weekend entitled "No Man Is an Island." 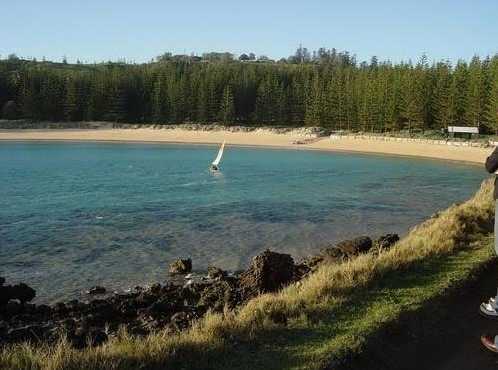 I have a fondness for Norfolk Island, despite never having laid eyes on it, in large part because of a lovely email I received from an islander last year after mentioning the island in a column. Unfortunately my emails to this lady have always bounced so I've never been able to let her know how much I appreciated her words. Ah well. Great article. While I am by no means an international globe-trotter, I do visit the San Juan islands every few years and stay for several days. Having done this for over 20 years, I can say without reserve that the people who live on those islands know far better than the greenies/warmies/thugs what true conservation looks like. They have an immediate self interest in living in a conservative manner. From water issues, to waste disposal, their way of life isn't a billboard campaign; it's just something they do. And they do it by choice (and necessity), not because some mainland thugs impose it on them by taxing the bat snot out of them if they don't comply. My vote is for the warmies to look at the log in their own eyes and straighten their own houses. Those type two greenies can take over anything that is doing great and ruin it. I wish they could all be gathered up and dumped in N.E Montana in Nov. Then they could show us how it's done. (Kidding) I wonder what the genesis of the word Norfolk is? We have one in this state but the locals pronounce it NorFORK. They hate someone saying it the way it's spelled. To the last Anonymous, there's a Norfolk in my state and it's pronounced NorFIK by most, or NahFIK by the old-timers. Funny! Anon 11:04, I do declare. That sounds a bit yankeeish to me. You must be from the deep blue N.E, part of this country. It is funny! OK, so we know the green thugs are out to control everything we do. What I would like to know is this: how do we thwart them? I don't for a moment believe the earth is warming due to human activity. In fact, I'm not even sure it's warming at an accelerated pace. Long ago I learned to never take anything as fact just because the "experts" say it is. Weren't the greenies shown to be liars and manipulators earlier this year? (Their emails were discovered, exposing them.) So why should the people believe anything these people claim? When did we stop thinking for ourselves? And, more importantly, when will we resume thinking for ourselves? The government wants to control how much energy we use by raising the prices of ALL energy sources, including wind and solar. It's not about the environment at all, it's about control. And the government wants to control us by issuing carbon credits. In those ways, the government can control where we go, what we do, how often we do it, and when. If I wanted to live that way, I'd move to Cuba or North Korea. Exposing the threat of green thuggery is important, but even more important would be to suggest some solutions. To Anonymous 10:41, I'm curious how cold it does get in N.E. MT? My daughter & her family just moved there (Sidney, MT) from Phoenix, and I'm trying to convince her that she needs a snow kit like those of us stuck in CA need an earthquake kit. If you live in the area, I might be able to send her this link to convince her. Patrice, great article as always. Sorry Linda in SoCal, I don't live there so I am only stating what is an obvious situation to anyone who lives in the plains. Keep trying or better yet send her a few things she should keep in her car. Getting stuck or having your power go out can be a serious situation.I hate to hear a mom worry. It takes me back. My first suggestion would be to pay attention to what your elected represenatives are doing and the vote according to what most closely matches what you want to happen. If I had a billion dollar idea on how to make fusion work. I would not have time to offer up even a bad solution.